Good weed management practices include rotating herbicide modes of action and layering preemergence and postemergence herbicides with residual activity. It’s been over two decades since the first Roundup Ready crops were planted in commercial fields. At the time of introduction, the technology was revolutionary for farmers, who found a highly effective and convenient chemistry to control a broad spectrum of weeds. Roundup Ready corn and soybeans quickly became the norm in fields across the United States, and as a result, application of glyphosate increased dramatically. 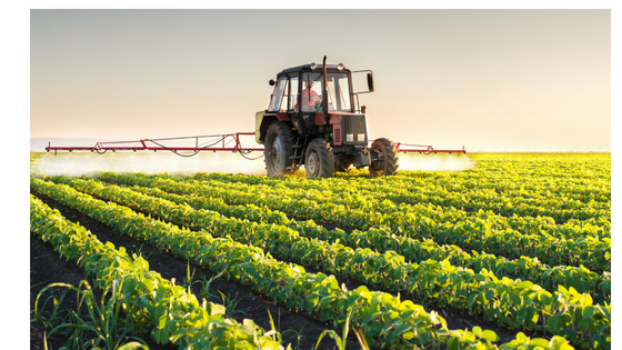 The initial ease and success of Roundup Ready technology may have caused some farmers to become lax with their weed management programs, which was ultimately a factor in the introduction of glyphosate-resistant weeds. The agricultural community certainly made mistakes with the introduction and use of Roundup Ready technology. As new herbicide and seed products, including dicamba and 2,4-D tolerant crops, are introduced, we can take learnings from the Roundup Ready era and develop smarter weed management programs. There’s no doubt that glyphosate and Roundup Ready crops revolutionized modern agriculture. In the initial years of use, glyphosate provided an effective, economical means to control weeds in Roundup Ready corn, soybeans and cotton. Because results were so favorable, farmers could spray once or twice per season to keep weeds at bay. But what farmers didn’t realize is that by relying so heavily on glyphosate, they were actually selecting for glyphosate-tolerant weed populations in their fields. In the wild, some weeds naturally have genetic mutations that make them more tolerant of specific chemistries, including glyphosate. In the case of glyphosate resistance, many farmers rotated Roundup Ready corn with Roundup Ready soybeans in fields for years without changing up their sites of herbicide action. So, those populations of weeds that had a natural tolerance to glyphosate weren’t adequately controlled, and instead, they matured and produced seed that led to the next generation of herbicide-resistant weeds. This process continued with each application of glyphosate, and eventually, fields exploded with resistant weeds that traditional herbicide programs couldn’t control. 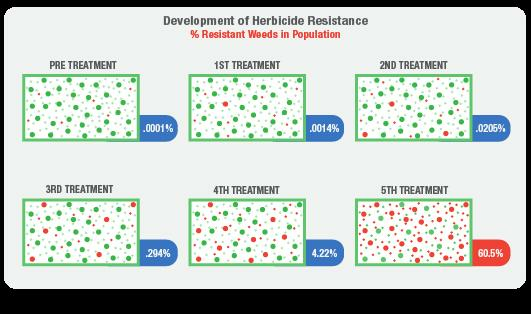 The graphic below shows how quickly resistant weed populations can reproduce when selection pressure is high due to repeated use of the same herbicide sites of action. Today, the International Survey of Herbicide Resistant Weeds reports that 17 weed species in the United States are glyphosate-resistant. By the time farmers started to understand what was happening in their fields, it was too late to turn back. As glyphosate’s efficacy declined, farmers applied higher rates and increased the number of herbicide passes to control troublesome weeds. The graphs below show how glyphosate use increased from 1992 to 2014 and how the emergence and expansion of glyphosate-resistant weeds grew during the same time period. Recently published research by scientists at Kansas State University found that glyphosate-resistant Palmer amaranth plants had generated many copies of the gene that glyphosate targets. Because those extra genes produced more of the enzyme that glyphosate targets in the plant, even very high rates of the herbicide are not lethal to the weeds. The researchers noted that once weeds have acquired these extra genes, herbicide resistance can happen in as little as one generation. They also pointed out that these DNA changes can be passed to a weed’s offspring and even other related weed species. We can use this research to focus on what can be done to limit herbicide resistance as farmers look to the next generation of weed control using dicamba and 2,4-D tolerant crops. As farmers look to new technology to fill the gaps where glyphosate has failed, it’s time to consider new management practices to extend the life of these products. Here are some ways to steward technology so that it remains available and useful in the battle against ever-changing weed populations. Roundup Ready crops changed the way farmers managed weeds. It was easy to run a one-pass system over the field without worrying about product performance. That put us in a bad situation, and we need to get back to the basics of weed control. Instead of relying solely on chemistry to take care of weeds, we need to think about a comprehensive plan of attack. That could include reintroducing tillage or other mechanical weed control methods. Adding cover crops can help eliminate competition and reduce weed populations. Changing up the crop rotation is another production practice that can help introduce variability in herbicide options. Our experience with glyphosate has shown us how quickly weeds can respond to a static weed management program. Changing up production practices can be a smart way to help keep weeds at bay. One of the most essential steps for slowing the development of resistant weed populations is to switch up herbicide site of action. Identify the most troublesome weeds and plan to use multiple, effective sites of action in a tank mix to target those weeds. Overusing chemistries with the same sites of action leads to resistance very quickly, as research has shown. The Take Action website has a convenient Site of Action Lookup Tool that helps identify families of herbicides that contain the same site of action. There is no silver bullet when it comes to managing weeds. Even though we have new tools to work with, we can’t treat them the same way we did glyphosate. It’s also important to remember that although we’re getting new herbicide products, we’re not seeing new chemistries and sites of actions. All the more reason to plan smarter herbicide programs. Chemical makers have done extensive research on herbicides before they hit the market. The product labels come as a result of that research, which gives the applicator specific directions to use the product responsibly to get the most effective weed control. 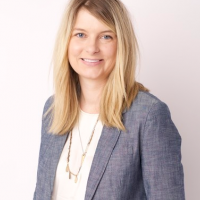 Following the label isn’t only the law, it’s also one of the best ways to ensure that new technology remains available in the future. As you probably know, weeds are harder to control as they get bigger. Timely herbicide applications make the difference between effective and sub-par weed control results. Most weed scientists agree that herbicides should be applied before weeds are four inches in height. Palmer amaranth can grow 2 to 3 inches per day under favorable conditions. That means there isn’t much time after weeds emerge to get that application made. A robust weed management program starts with a season-long strategy. A fall burndown herbicide application with residual control can take care of winter annual weeds while they are small and easy to control. In the spring, layer preemergence and postemergence herbicides with different sites of action and residual control. The effectiveness of glyphosate in Roundup Ready crops means that some farmers relied heavily on the postemergence herbicide application to take care of weeds. Now, more than ever, a preemergence application that contains a residual active ingredient is crucial. It takes pressure off of the postemergence application, especially in cases where the weather makes it impossible to make a timely post application. Most farmers do an adequate job of scouting fields before herbicide applications, but it’s also a good practice to scout after a herbicide application to assess control. Keep a record of what weeds are most troublesome and document field locations where they weren’t adequately controlled. Unsatisfactory weed control could be caused by a variety of variables, including poor herbicide coverage, wrong herbicide rate, weather conditions at and after application or resistant weed populations. One way to confirm weeds are indeed resistant is to send tissue or seed samples to a lab for verification. Purdue University and the University of Illinois are two institutions that offer resistance testing for weeds including Palmer amaranth, waterhemp and giant ragweed. The University of Illinois reported that nearly 75 percent of field samples submitted in 2016 included glyphosate-resistant weed populations. In Iowa, that number was closer to 90 percent. The new 2,4-D and dicamba-tolerant seed and chemistry technologies are coming at a time when farmers are in dire need of solutions to help combat herbicide-resistant weeds. We’ve essentially been given a do-over with this new technology, and we shouldn’t take this opportunity for granted. The EPA, state and local governments are already taking a hard look at how to proceed with low-volatility dicamba herbicides. After two years of commercial use, there is still too much off-target movement with these products. If we want to make sure the technology remains available, we have to use it responsibly. Follow the label instructions. Use good judgment when you’re spraying. Be aware of sensitive crops and areas that surround your fields. There are no corners to cut when using these products. Let’s not make the same mistakes that we did with Roundup Ready crops and glyphosate. Smart application practices not only make weed control more effective, but they also help to keep these products available and extend their lifespan.